Ooooooh~ Verbal Jint is in the episode. Mister Verbal Jint as Kim Gu Ra calls him. Was the masked announcer wearing glasses over his mask? Lol. They sang a Sung Si Kyung and IU duet, classy. I feel like the Bejewelled Sheep Head is cheating a little with her legs. I love how they also put classical music when Verbal Jint spoke. 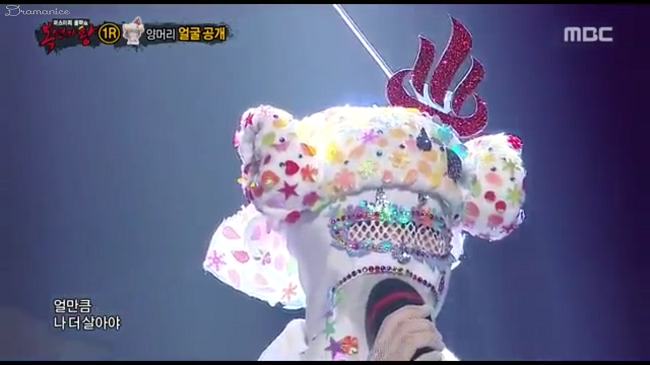 Bejewelled Sheep Head is musical actress Sun Woo. Such a groovy song and watching them perform was so much fun! I thought the guy sounded like Lee Hyun formerly of 8eight. Yay! The audience agreed w/me. OMG! It was Yoon Hyung Bin. But AHHHH they sang FTTS’ “Missing You”, major throwback. I know the Egg Dude is VIXX’s Ken. Even if Twitter didn’t tell me, I would have been able to guess it was him. The other dude is Go Yoo Jin of the band Flower. He has a really good voice! SN: Kim Gu Ra thinks that Cleopatra is Noel’s Jung Woo Sung. YASSSS! I agree. I also know that the highlighter lady is Apink’s Eunji. Her voice would have been a little harder to guess. The dude is an old school k-pop idol, Jung Suk hyun from the group S#ARP (I think that’s how you spell it, lol). Cheetah dude sang “Hee Ya” by Boohwal. Classy song but risky because it’s so classy. He did well though. Everyone was just groovin’ along to both songs, haha! Cheetah won, he had my vote. Bing Soo lost and it’s actress Hyun Jyu Ni. Her mask will always be in my heart. Eunji makes a slight rhythm mistake but covers it up professionally. I wouldn’t even have noticed if the panel hadn’t mentioned it. Cheetah’s song was super groovy. But then what Wheesung song isn’t? Lol. His GRRRRRRRRR doe. He really was channeling his mask. I 💜💜💜 the song Eunji sang. Kim Tae Woo’s “Love Rain” was my jam when it first came out. Eunji won! Now is the time where I voice that I think that Eunji is waaaayy to good for Apink *hides from all the Apink fans*. Cheetah dude is none other than Na Yoon Kwon, whom Sandeul guessed earlier on in the episode. He’s getting much better at guessing people, lol. Cleopatra wins for a 3rd time (I think). I personally think that Eunji should have won. Not being biased or anything…*shifty eyes*. Check out our QT Epik Vlog So High Series, where we vlogged our NY and Epik High concert adventures!